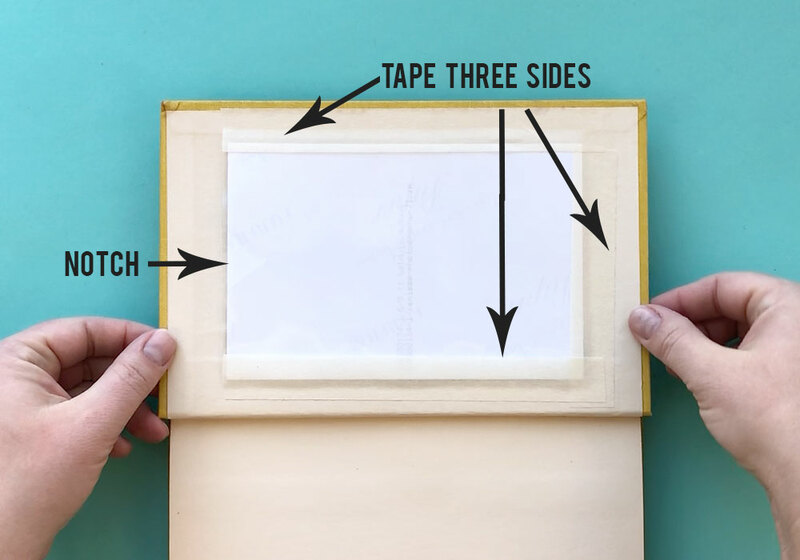 In today’s post: Learn how to turn an old hard back book into a cool DIY book picture frame. One of the very first craft ideas I posted on this blog was a picture frame made out of an old book. 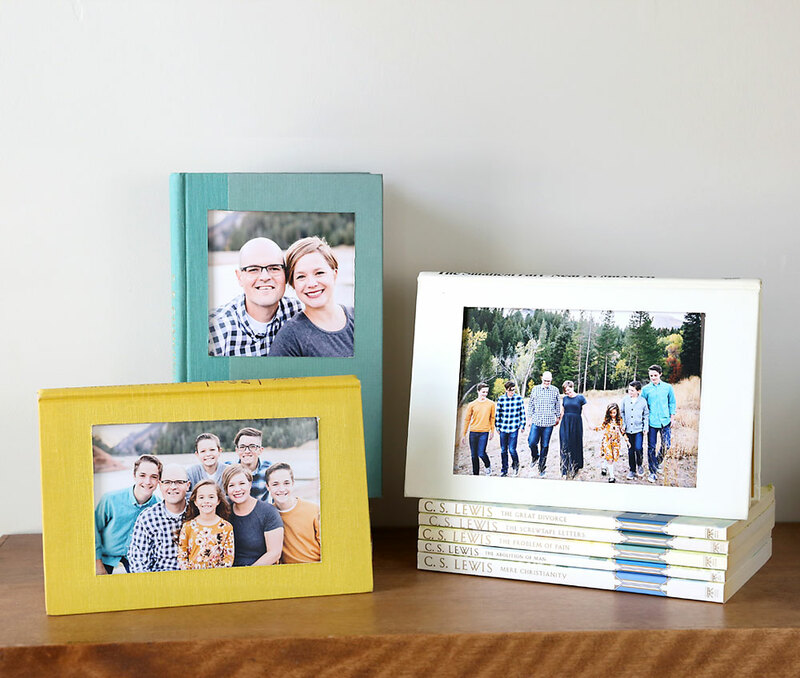 I’ve always loved this simple craft idea because it combines my two favorite home decor items: book and family photos. 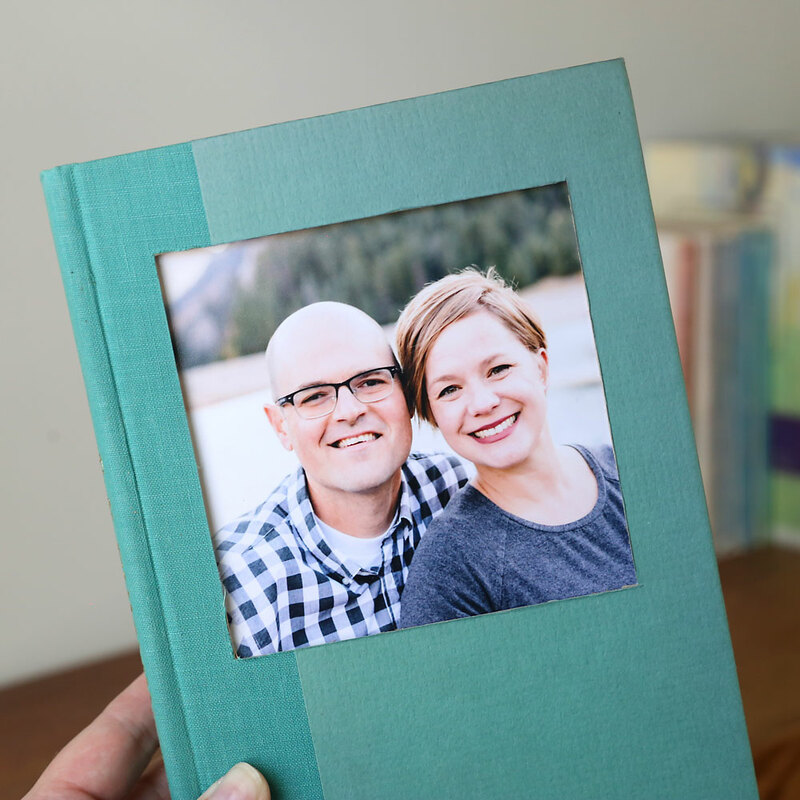 So I decided to revisit that idea last week and today I have new photos, new instructions, and a new video that shows you how to make your very own book picture frame. There are a couple of cool things about this project: First, it doesn’t harm either the book or the photo. The book is still totally readable, and the photo is totally removeable. That’s actually the second cool thing about this project: because the photo is removeable, it’s easy to swap it out and swap in a different one anytime you want. And finally, this project is only going to take you about 15 minutes. Yes, it requires some Exacto knife wielding and a bit of elbow grease, but you’ll have plenty of time left over after you finish to, you know, read a book. 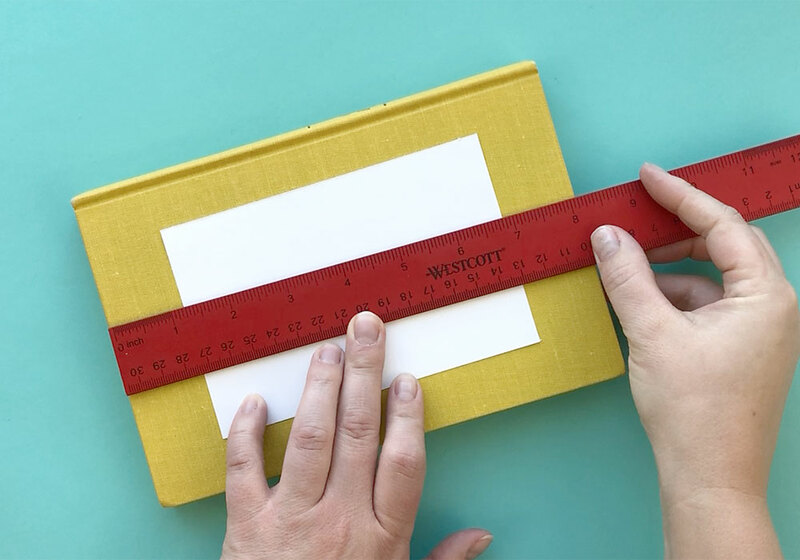 Watch this video to see how you make your very book picture frame (written instructions follow). Hardback book: You can find inexpensive books at used book stores, garage sales, the dollar store, or the library. 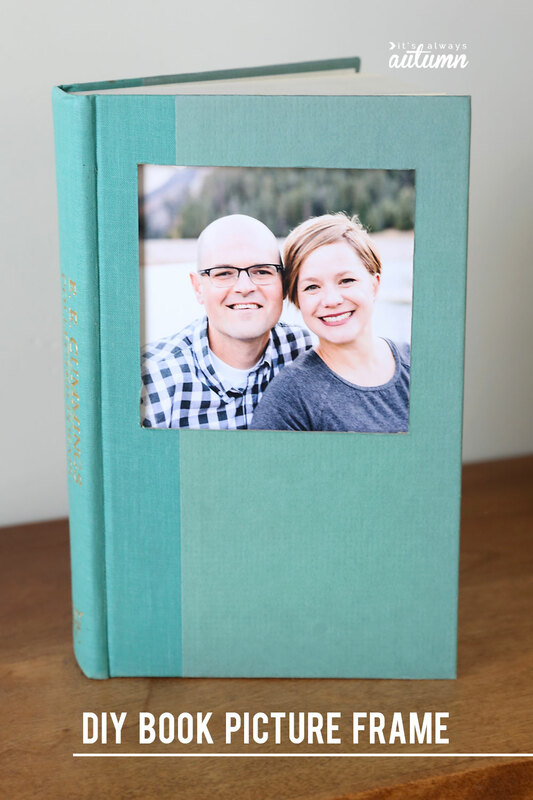 Be sure to remove the paper dust jacket to see what color the book is and make sure either the front or back cover is not covered in pictures or words. Sharp exacto knife: Seriously, you want it sharp, so grab a new blade if yours is getting dull. 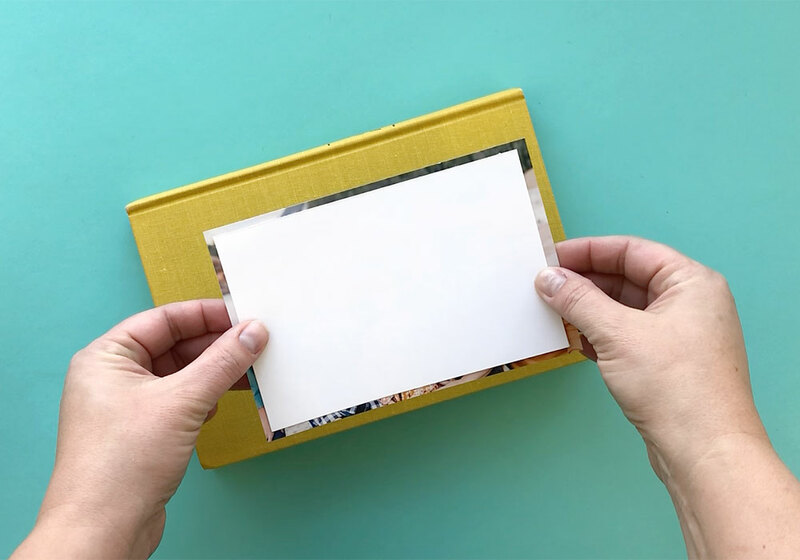 Step 1: Cut a paper rectangle that is slightly smaller than the photo you will be using in your book frame. In the example below I planned to put a 4×6 photo in the book frame, so I cut a paper rectangle that is 3.5 by 5.5. Step 2: Center the paper rectangle on the book. 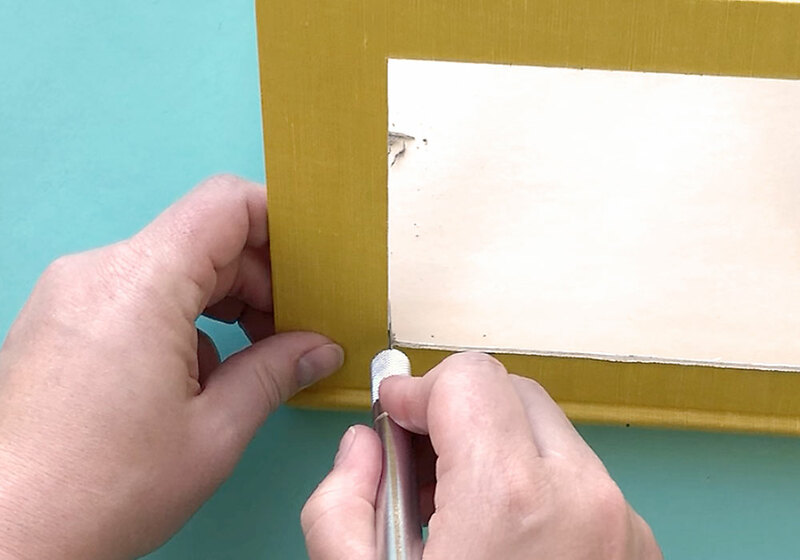 It’s worth using a ruler here to make sure the frame looks even once it’s cut. Once you’re sure it’s centered, trace around the rectangle. Step 3: Cut out the rectangle. This is where you need your sharp Exacto knife and metal edge ruler. I like to slide a cutting mat under the book cover to ensure I don’t end up cutting through any pages of the book. Use the knife to cut along the lines you just traced. DO NOT attempt to cut all the way through the book on your first pass – it’s not going to work and you’ll end up hurting yourself. Plan on 5-8 passes over each line, using firm pressure. Please be careful and DO NOT allow children to attempt this step. Step 4: Clean up the frame. Once you’ve cut the opening out of the book cover, there will likely be a few straggly bits of cover, especially in the corners. Use your exacto knife to clean those up if desired. Step 5: Create a “sleeve” for your photo. 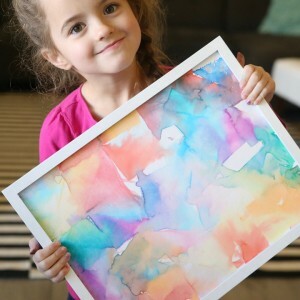 Slide your photo into an acid free page protector. Nestle it into a corner, then use scissors to trim just outside the photo on the other two sides. On the part of the page protector that is behind the photo, cut a “notch” on one short side (you can see the notch in the next photo). Step 6: Tape the sleeve behind the opening. Place the sleeve behind the opening you cut in the book, and tape it to the book along 3 sides. 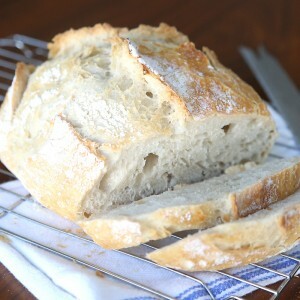 Leave one side open (where you cut a notch). This allows you to easily slide a photo in and out of the sleeve. I used masking tape in these photos. For longer, stronger hold, scotch tape would probably actually work better. 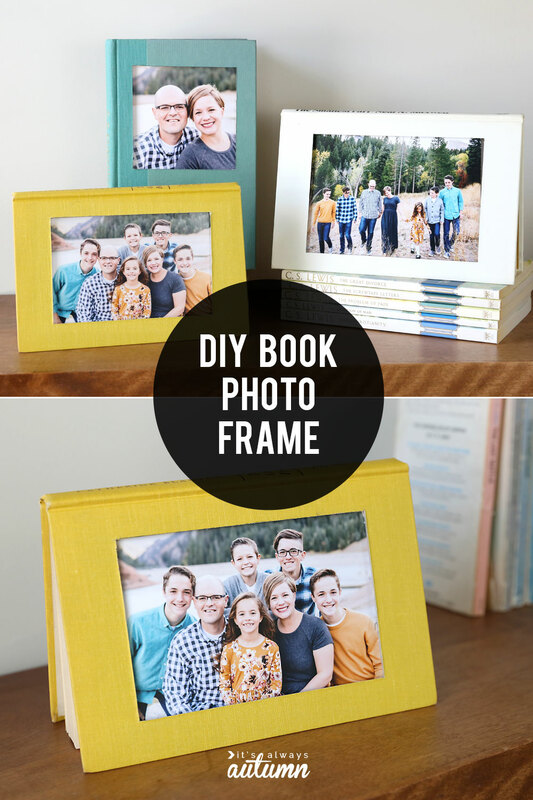 And your book photo frame is complete! Anytime you’d like to change the photo, just open up the front cover, slide the old photo out, and slide a new photo in. 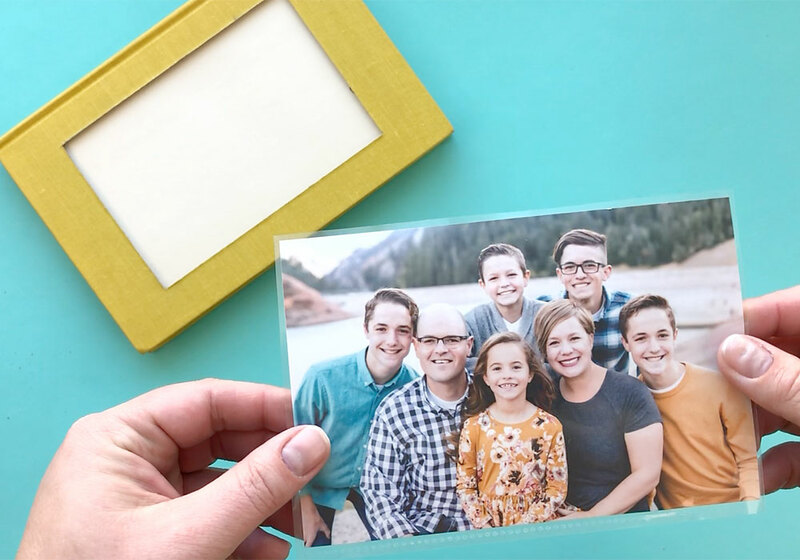 One last note: Using a plastic page protector keeps your photos clean and protected and I would definitely use one if you are displaying a photo that is old or hard to replace. 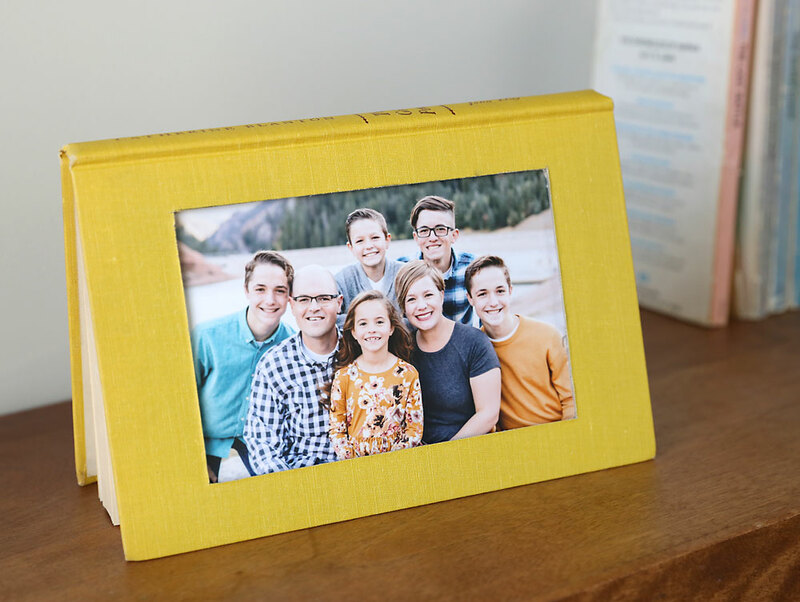 However, if you’re displaying photos that are easily replaceable, you can skip that step and just tape whatever photo you’d like to use behind the opening. Fantastic idea! and I love the way you can change the photos so your not stuck with the same one on display and the photo stays intact. 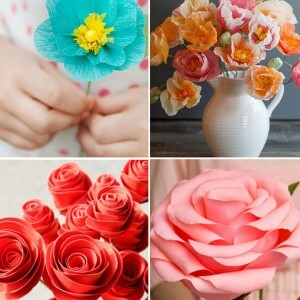 Cute, smart, funny, creative and can use an exacto knife with your left hand….wow!!! Neat idea! 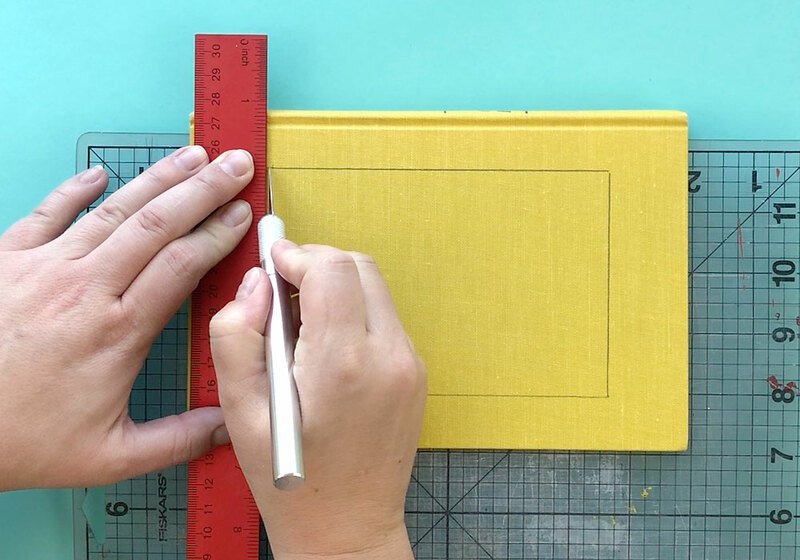 I would feel bad cutting up the cover of a hardcover book (I love book page projects but just can’t bring myself to do it!) but I like that you pointed out that the book is still completely functional. 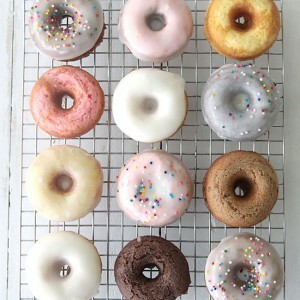 Visiting from Tatertots and Jello’s Weekend Wrap Up! thank you for sharing, we have a library of books and when I get a new book, I always write a note into it and date it. Because we tease the kids when we die they will have to get rid of all these books.. this is a way to maybe keep some on their shelf… LOL.. I am quite the sentimental one..